Pulse until chopped into smaller fragments, stopping to scrape and redistribute if necessary. Process until chile and garlic and finely enough diced. Place in medium to large saucepan over medium heat. Bring to a simmer and cook at a low simmer until the liquid has mostly evaporated. Allow to cool, then refrigerate and serve with EVERYTHING. It’s best to play with the proportions of this recipe to suit you or your fellow diners taste. In particular sugar and vinegar should be tweaked : 6 tbs sugar makes something close to what is purchased in asian markets as shelf-stable tuong ot toi, 2 tbs is more like what would be served on the table at a restaurant. The larger amount of vinegar will make it take longer to cook and reduce but easier to process everything initially. And naturally it will make it more sour. I usually use 2 or 4 tbs of sugar and 1/2 cup of vinegar. This is undoubtedly the world’s finest table sauce. There is simply nothing finer in any cuisine that goes so well with so many cuisines and especially with so many simple foods. Raw and cooked vegetables, eggs, noodles, soups, sandwiches (unbelievable on banh mi), salads, tofu, pork, fish, and really pretty much anything is enlivened with a little dab of this. Butter, noodles and a spoonful of this with maybe a little cilantro would probably be my final meal if I had to have one. But I won’t! I will live forever, making millions and millions of batches of tuong ot toi! At least, that’s the plan. These are exceedingly simple. Perhaps too simple to even need a recipe for. 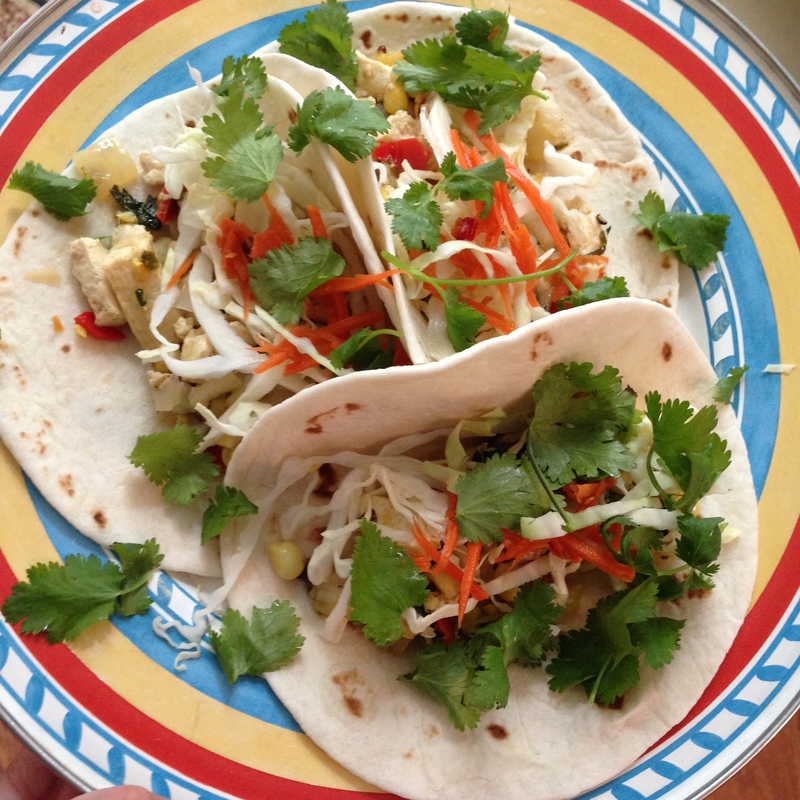 Nonetheless I will present it in the hopes that it will inspire other simple improvised tacos. Sautée for about two to three minutes, enough to warm the tofu through. Break the tofu into pieces of whatever consistency is preferred with a flat-ended wooden or silicone spatula. I usually like a little variety. 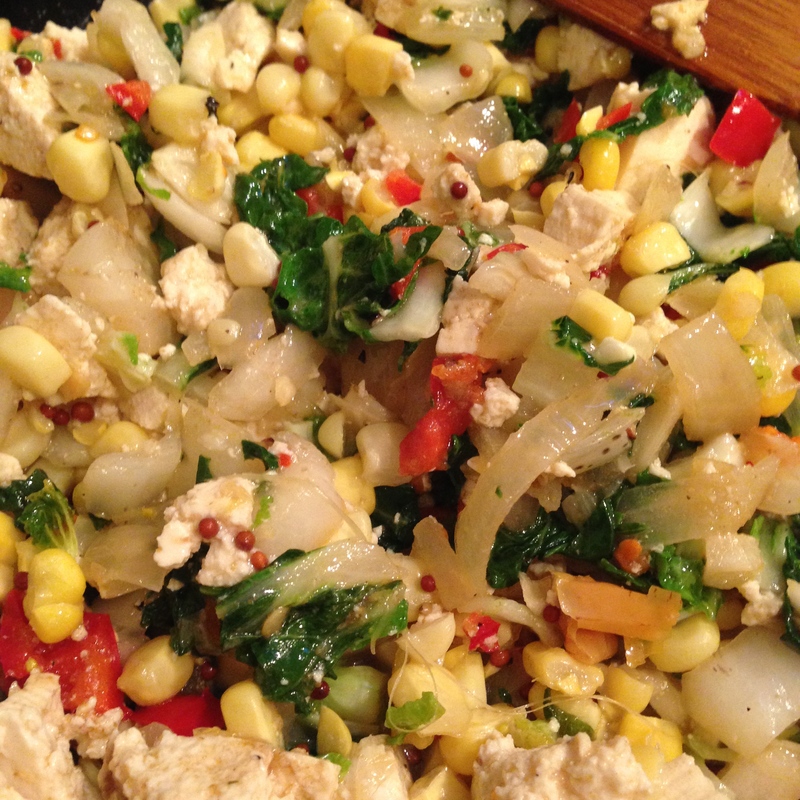 Remove from heat and add 1/2 cup of fermented corn. Regular corn can be substituted. Serve on freshly-made or store (or better yet, taqueria) bought corn, flour or whole-wheat tortillas. 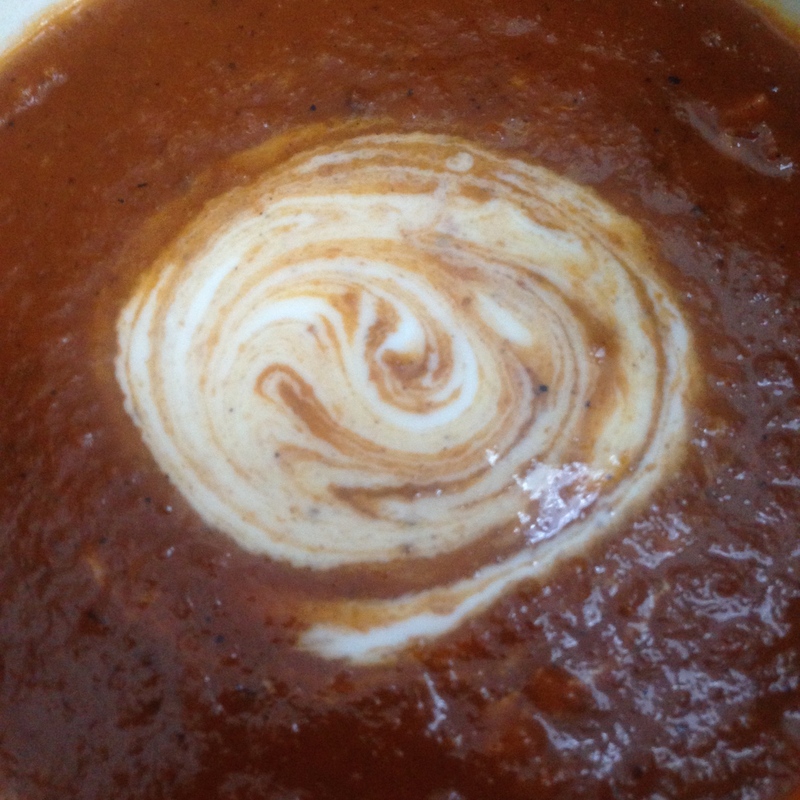 A simple, deeply-satisfying soup for the end of winter, spiced with a freshly made masala mix. You can use this same basic mix in other masala recipes, but this one is designed specifically for this soup. First, make the spice mix. Then grind the mix. Then begin the soup. Heat a dry skillet over medium to medium-low heat. 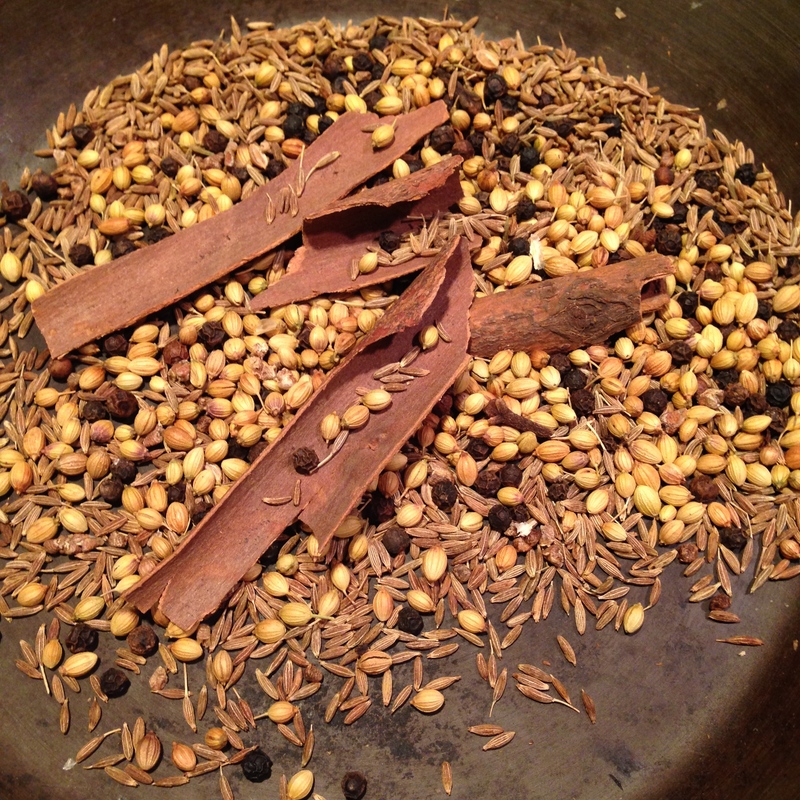 Toast the dry spices together for a few minutes, until strong and aromatic but not browned. Grind spices together in mortar and pestle or spice grinder until no longer coarse. Cook for three minutes then reduce the heat to low. Cook the vegetables for as long as possible over a low heat, uncovered, until they are mostly softened and succulent. Break the tomatoes into the rest of the vegetables with a flat spatula or wooden spoon. Bring the heat to medium. Cook for a few minutes, breaking the tomatoes up as much as possible. Simmer slowly for at least 45 minutes, stirring occasionally. This should cook down to make a little over a quart of really rich soup. You may also wish to add less liquid to save on cooking time, although some at least should be retained or what we have is a sauce, not a soup. As it stands, this is a nicely rich soup for winter or early spring, and can be mellowed out / lengthened with a little bit of fresh yogurt, stirred in just so. 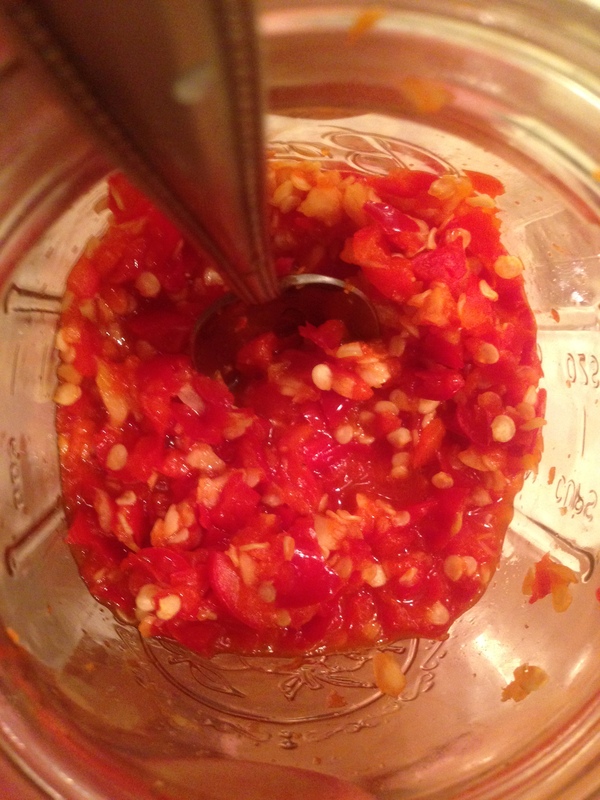 There is plenty heat for most in the pepper and spices, but for those who must always add chile, dried chiles can be added to the spice mix. You may also wish to add fresh herbs – though I am always a fan of that, I feel it tends to spoil some of the warm simplicity of the soup. A better direction to go in would be to stir in cooked lentils or rice or small pasta and make it more of a stew. Key : The key to this recipe is to take it slow, man.